Blue herons, a familiar bird on Wisconsin’s waterways, is one of the many species that people can see during Saturday’s Birds, Bikes & Brews. The Madison Audubon Society event is a fundraiser, but primarily a way to get people interested in the wide variety of birds that make Madison their home. The cooper’s hawk is commonly seen throughout the year in Wisconsin, nesting in tall trees and eating small birds and mammals. Sandhill cranes are a familiar and beloved bird around Wisconsin. “No matter when I see a crane in an area where there are people, it’s a guarantee someone is stopping to see it, taking a picture of it, posting it to their Facebook page,” said Matt Reetz, executive director of the Madison Audubon Society. Since it’s in our nature here in Madison to go for a bike ride or drink a beer, it only makes sense to add some actual nature to the equation, too. There will be a little of all three on Saturday during Birds, Bikes & Brews, hosted by the Madison Audubon Society at Next Door Brewing Co. Participants will get a chance to ride the Lake Monona loop, check out what birds they might see along the way and drink a special bird-themed beer created by Next Door. It’s the second year for the event, which is partly a fundraiser but aims primarily at getting people interested in the birds or the Audubon Society, organizers said. “We all think if people are out there enjoying them in their home city, they’ll be moved to either enjoy them more or get involved in helping their habitats,” said Carolyn Byers, Madison Audubon’s education and operations specialist. For $5 participants get a checklist of birds they might see, and a pint of beer (or non-alcoholic beverage). From there, $1 of each specialty pint sold will go to the organization’s conservation and education programs. “Bird puns are fun,” said Emily Meier, the organization’s communication and outreach coordinator. Last year’s event was self-guided; this year there are two guided rides, one at 3 p.m., and another at 4:30 p.m.
Byers and her husband, B.J., will be leading one of the guided rides. She found herself doing that last year, even though it wasn’t a guided ride and she didn’t even work for Madison Audubon at the time. And while many experienced birders go for a “big year” — spotting the highest number of species in a year — an event like Birds, Bikes & Brews can add a twist to that. “People have started doing ‘big green years’ — the most birds people can see from a particular point on bike or by kayak or some way without fossil fuels,” Byers said. But for this event, experience is not required. In fact, having people new to birding is what makes it fun, Byers said. The organization wanted to give people a fun way to get started, Meier said. “Sometimes it can be a little intimidating, especially on a field trip, to go with someone who has a species list that’s longer than birds you know even existed,” she said. Participants will get a checklist of birds they might see along the route, with space to add other birds they might spot. Because the city has a lot of green space as well as wetlands, water and grasslands, there’s a wide variety of birds to see here, Reetz said. “There are not very many species that don’t come through this area,” he said. “Of the 200-some species that have been reported in Wisconsin, the majority have been sighted in Madison. Almost all of them come through here. • On Oct. 4, the Madison Audubon Society and UW-Madison's Lakeshore Nature Preserve host a fall bird walk from 8 to 11 a.m. The walk begins at the Class of 1918 Marsh Lot 130 (2004 University Bay Drive); lakeshorepreserve.wisc.edu. 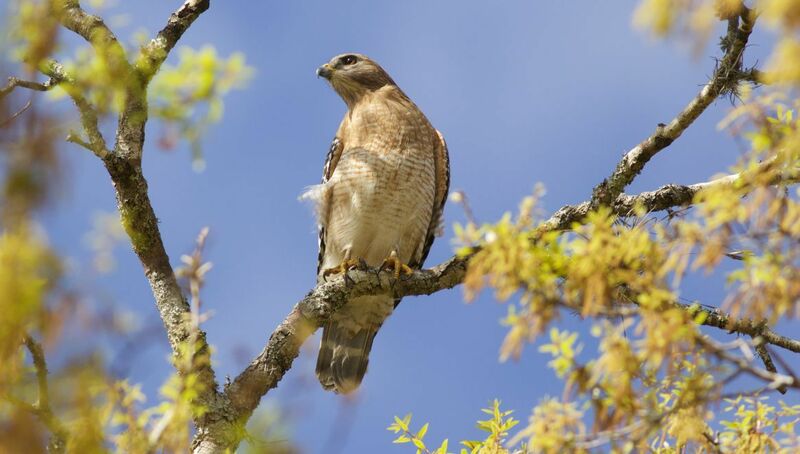 • Madison Parks, in cooperation with local nature organizations, hosts a weekly bird and nature walk year-round from 1:30 to 3 p.m.; www.cityofmadison.com/parks/activities/birdnaturewalks.cfm. First Sunday of the month is at Cherokee Marsh, 6098 N. Sherman Ave.; second Sunday, Turville Point Conservation Park, 1145 Olin-Turville Court; third Sunday, Warner Park, 2930 Sherman Ave.; and fourth Sunday, UW's Lakeshore Nature Preserve, 3015 Lake Mendota Drive. • For more information on Madison Audubon Society events, go to www.madisonaudubon.org/calendar.